A new EU-Project has been started. 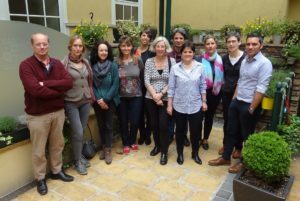 The MICROMETABOLITE project coordinated by Angela Sessitsch from the Center of Health and Bioresources was launched on 1st May 2017 and the first coordination meeting was held in Vienna. MICROMETABOLITE runs from May 2017 to May 2021 and is financed by the European Marie-Skłodowska-Curie Innovative Training Networks programme. Thirteen partners from academia and industry in Austria, Belgium, France, Germany, and Greece investigate how to use plant-associated microorganisms in Boraginaceae plants to improve the production of alkannins and shikonins, which are essential ingredients in pharmaceuticals and cosmetics. The project involves the training of 11 PhD students whose research topics will range from exploring microbial mechanisms in stimulating plant metabolite production to up-scaling to a microbial-based production system.